by Sarah - March 18th, 2014. Position: full sun or partial shade Soil: fertile, well-drained soil, neutral soil Rate of growth: average to fast-growing Flowering period: May to June and September Flower colour: pink Other features: ideal for growing in a container Hardiness: fully hardy Luscious, large, deep pink, early summer flowers with a darker pink stripe and mid-green leaves. 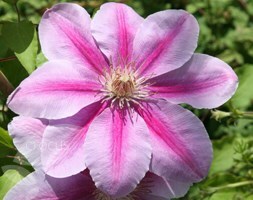 This compact clematis is ideal for growing through a climbing rose or tree in partial shade. Although it may take time to establish it is well worth the wait, since it is a prolific flowerer. Garden care: Remove dead and damaged stems before growth begins in early spring, cutting all remaining stems back to where strong buds are visible. Apply a slow-release balanced fertiliser and a mulch of of well-rotted garden compost around the base of the plant in early spring.